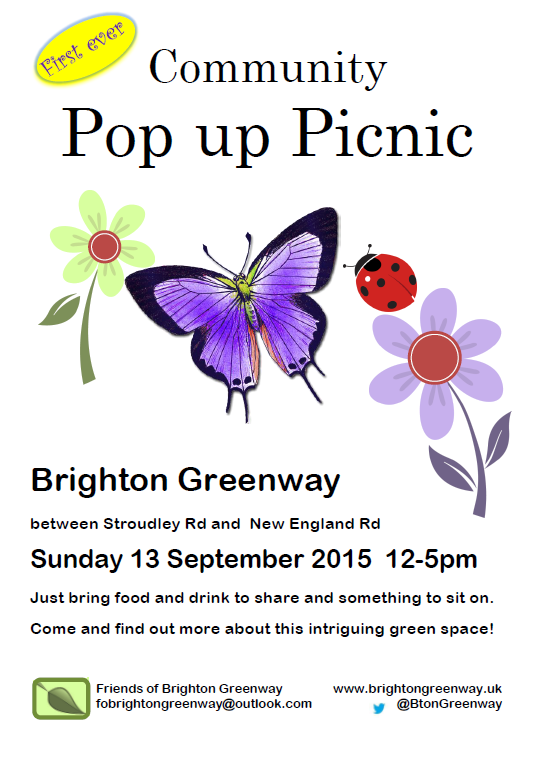 SUNDAY September 13th 12-5pm POP-UP PICNIC up on the Brighton Greenway. All welcome. We’ll be in the area behind Boston Street, accessed either from New England Road (stairs up embankment, over the iron railway bridge) or from Stroudley Road (just down from Jury’s Inn hotel). Bring food and drink to share, and something to sit on. If it rains, the Clarendon Centre (CCK) in nearby Boston Street have offered to provide shelter, so come along anyway! At 1pm, we’ll be ‘inaugurating‘ this first ever community event on Brighton Greenway: we hope to have Cllr. Pete West, Deputy Mayor and ward Councillor with us to do the honours, and we’ll be unveiling a new plaque which provides the background to the ‘Ghost Train’ sculpture on the New England bridge. Natasha, resident choreographer from nearby Bird Studios, is planning a surprise performance with her colleagues. Come and find out more about this Site of Nature Conservation Interest, site of 19th century railway heritage and (potentially) lovely pedestrian walkway between Brighton Station and New England Road/Preston Circus. We’ll be having a pre-picnic clear-up session on FRIDAY 11th September 4-6 on Brighton Greenway: come along with gloves and secateurs if you can.